I changed the coloring on my C-47 that's hanging to match the plane at the museum I work at. Changed the tail # and nose art too. The glue I had was called "The Crafter's Pick: The Ultimate". It's a thicker PVA glue, like a heavy Aleene's. I like it because it sets up really fast and will stick to almost anything. I've used to to glue a brick back together! For modeling, I like it for areas that are hard to get to stay together (like seems along canopies or wing fairings) and would normally take a long time set up with regular Tacky glue. The Ultimate will usually set up in a matter of seconds. I still use Turbo Tacky glue for everything else. In some places on a model, the Ultimate stuff can be a good alternative to CA glue. I hope the surgery will help you out with the vision and migraines. I can't imagine it is very enjoyable when you can't see or think straight. Get better so you can get building! Oh my, I've been a bad modeler. I haven't been able to build with nearly the tenacity of when I started many moons ago. But, I have had the chance the last few months to get some builds done. I'll post a couple of FG kits here, and some Oddball/Murph's Models on the other thread http://www.fiddlersgreen.net/forum/viewtopic.php?f=3&t=4383 . F-104 Starfighter, done in white. I'm working on finishing up a display stand for it, as I didn't want to fiddle with the spindly little landing gear. I'll also have either the FG Sikorsky S-64 Skycrane, or the OddBall MH-68 to represent the helos. One of the models I am entering into the competition is the Thai Paperworks P-51 "Gunfighter". 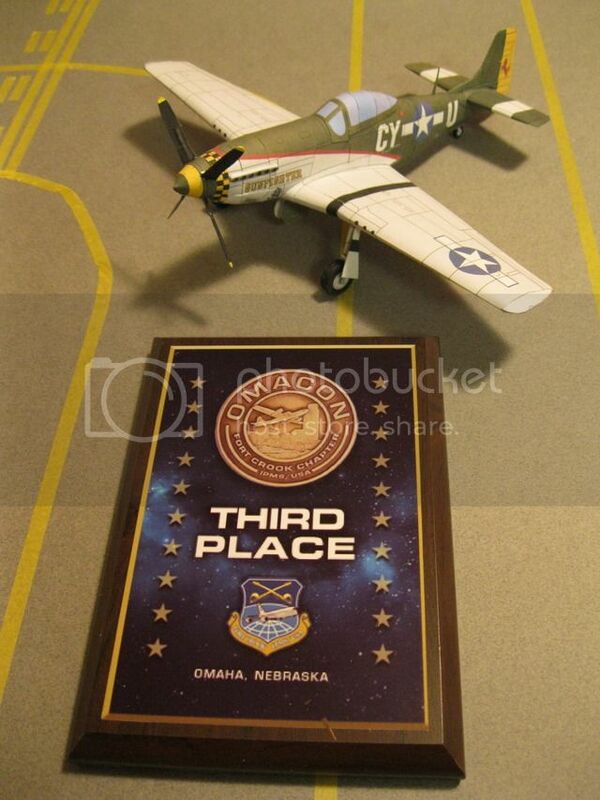 I chose this model as the actual aircraft is based here in Omaha at the local CAF wing. I'm also going to enter the B-25 in Doolittle Raider scheme from Muprh's Models and the F-105 from Murph as well (Oddball). You can find pics of those on the other thread linked above. I finished up the stand for the F-104 today. I used the basic stand from Murph's Models and enlarged it 150%. I then backed the 110# cardstock with cereal box material. Once I had it done, it looked a bit shabby as I had a few glue smudges on the white paper. So, I pulled out the black spray paint I had used on the F-105 base and put on a few light coats. I also added the F-104 patch, and of course, the FG logo so that all would know where it came from. I used two pieces of a bamboo skewer as the connection pieces. I used my mini hand drill to make two small hole in the bottom of the plane, right at the center of balance. The skewers just slide in, and are held in place in the plane by the many sheets of wadded up paper towel that I shoved inside the fuselage for extra support. I like it too! Nice looking model. Is there a plan for the stand? I got the stand from Murph's Models (Aaron Murphy, formerly FG designer). The download link is at the bottom of the listings. I enlarged mine 150%, but it's the same template. A black stand against the white F104 makes the model stand out. It's a good build, both stand and jet. Today was the 2015 Omacon IPMS show at the Strategic Air and Space Museum. I was there to represent paper to the masses. I had a "vendor" table set up to show off some models, and to hand out some freebies that were generously donated by Dave Winfield (Dave's Card Creations) and Ryan Short (Lbirds.com). 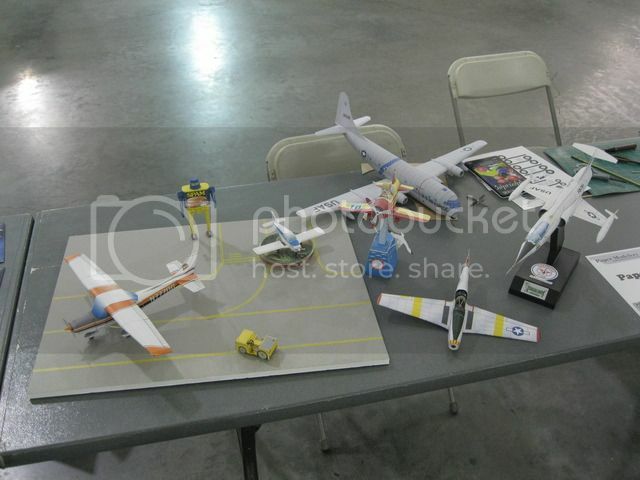 I also handed out some info sheets with a list of sites to visit for more information and models. Of course, FG was top of the list! I entered three of my models into the competition. 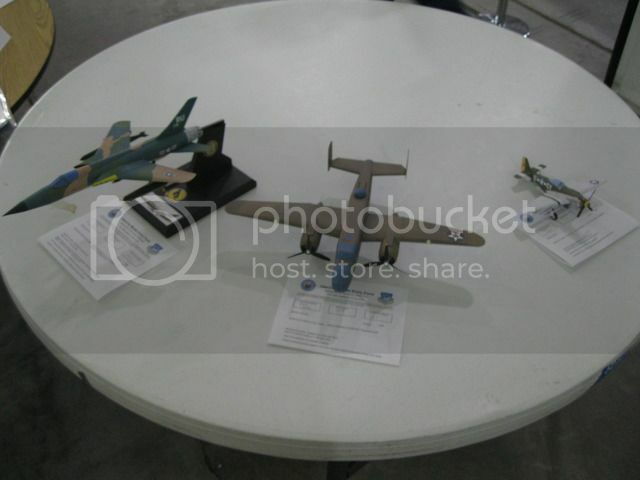 The Oddball F-105, Murph's Models B-25 Dolittle Raider, and the Thai Paperwork P-51 Mustang. I would have swept the paper subgroup of the miscellaneous category, but there was one other paper model present, and it was awesome. It was a model of the Empire State Building at the moment of the B-25 collision back in the 40's. He cut away the face of the building, custom molded some plastic to look like flames, and wired it to light up with red and orange LEDs. he also had the tiniest of B-25 models (about 3/4 inch wingspan) stuck into the side of the building. I wish I had a good picture of it. There were always people right in front of it when I had time to be up and looking at models. When all was said and done, I had passed out all of my freebies (about 80 copies all together). I also collected so awards. 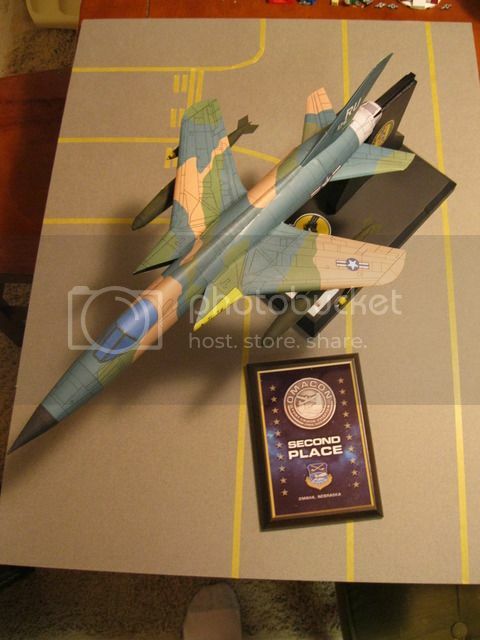 By P-51 model came in 3rd, and the F-105 was 2nd. Way to go Willy! I bet a good time was had by all. Congrats on the awards. Looks like they were well deserved. Nice job! Thanks guys. It makes me really excited for next year. I hope they release the special categories soon, so I can work on some over the summer. I'd say the F-105 is a medium difficulty build. Most of it is quite easy as it's just a tube. But, getting the long spine piece on straight can be tricky. I added some tabs along the piece that I also cut in slots for in the fuselage. I spaced them out and put them in spots where the paper didn't want to hold in spot on its own. I'm not sure how many true converts i may have inspired. There were a few folks just going through the museum that stopped by as well. Many of the kids were really excited to try the models. 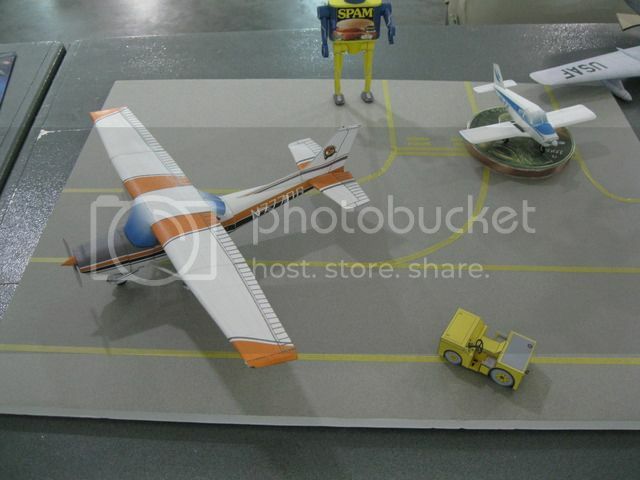 There were even a few of the plastic jockeys that had done paper modeling before.